In this series of blog posts I will show how JEB’s MIPS decompiler 1 can help you find and exploit software vulnerabilities in embedded devices. To do so, we will use Praetorian’s Damn Vulnerable Router Firmware (DVRF) written by b1ack0wl. 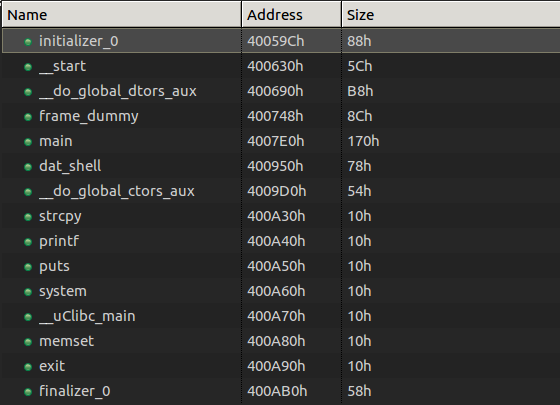 DVRF is a custom firmware made to run on a Linksys E1550 router containing a bunch of memory corruption vulnerabilities. The goal of the DVRF is to serve as a playground to learn exploitation on the MIPS architecture. As far as I know, there are no write-ups of the challenges on the Internet. For the readers interested in testing the challenges by themselves, I suggest to follow the DVRF tutorial, and getting a complete MIPSEL Debian QEMU image as it allows the usual exploit development workflow on Linux, without any limits on the available tools. Among some classic libc interesting routines (system, strcpy…), I noticed the aptly named “dat_shell” function. As we see here, this function congratulates you for solving the challenge then spawns a shell with the call to system. We now know that we want to redirect the execution flow to the dat_shell function. Next, we see that the binary calls “strcpy” and that may just be a textbook case of buffer overflow. So let’s check the main function, where strcpy is called. First, it checks if we provided a command-line argument, and welcomes us. Second, it copies user input in a local variable and prints what we entered. Finally, it tells us to “Try Again” and then returns. Fortunately, strcpy does not check its input size, which results in a stack buffer overflow as the challenge’s name indicates. As you would do in a similar situation on a x86 binary, let’s first run the binary inside a debugger with a large parameter to verify the overflow. To do this, I started a gdbserver on my QEMU VM and attached to it with JEB’s debugger interface (see the debugging manual for more info). In MIPS ISA, the return address from a routine call is stored in a specific register called $ra, which is also filled from the stack as you normally see on x86. It then jumps to that saved return address. Let’s check the stackframe that I reconstructed to calculated the appropriate padding. You can access that view with the Ctrl+Alt+k shortcut in the function of your choice. I changed the type of the variable buf to a char array of all the available size between the start of the variable and the next one. This gave me 200 bytes. We can see here a memory access to the address computed by adding the offset 0x801C to the global pointer register $gp. The problem here is that $gp was initially set at the beginning of the routine from the $t9 register (see 0x4000958 above). So, where does the value in $t9 comes from? The answer lies in the way routines are usually called on MIPS (the calling convention): the $t9 register is first set to the address of the target routine, and is then branched to, for example with a jalr $t9 instruction (see MIPS ISA p.50). The global pointer $gp is then initialized with $t9 and serves to compute various offsets, in particular to other functions that will be called, hence the fact that it absolutely needs to be correct. In other words, if the value of $t9 is not the address of dat_shell when executing this routine, there is a good chance an invalid memory access will happen during the routine execution. To build a successful exploit, we need to load an arbitrary value from the stack into $t9 and then branch to it, as it was a real function call. To do so, we need a “gadget”, that is a series of instructions implementing the previously described behavior that we can jump to. In the search of this gadget, let’s first check what dynamic libraries are loaded with the “libs” debugger command. Luckily, we have three libraries loaded at fixed memory addresses: libc.so.0, libgcc_s.so.0 and ld-uClibc.so.0. Using gadgets is a common need to build Return-Oriented-Programming (ROP) exploits, so I decided to develop a gadget finder plugin 2. Also, rather than searching gadgets from native instructions I decided to use JEB Intermediate Representation (IR), such that I could find gadgets on all architectures handled by JEB transparently. The output is free of duplicated gadgets and alphabetically ordered to ease the process of finding interesting gadgets. So, how does it work exactly? Using JEB’s API, the plugin converts the native code to the IR used in the first stage of our decompilation pipeline. At this stage, all the side-effects of the native instructions are exposed and no optimizations have been made yet. To find gadgets — a series of instructions ending with a branch –, we simply search for the assignments on the program counter register and iterate backwards until another assignment on that register is made. 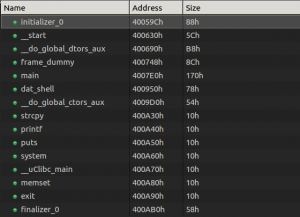 The last step is to filter out relative jumps — which can not really be controlled during an exploit — and we got ourselves a good list of ROP gadgets. It copies a value from the top of the stack into the $t9 register, and branches to the $t9 register… perfect! Special thanks to @b1ack0wl for the challenges and help and to @yrp604 for the review. This post was also co-authored with our own @joancalvet. Stay tuned for more MIPS exploitation blog posts!